Having previously worked in an SEC Reporting role, I now specialize in helping my industry peers find Financial Reporting solutions that best fit their organizations. You can count on me to help you navigate any questions you might have as they relate to your SEC Compliance. I’ve helped my clients reduce their SEC Compliance costs without compromising any value to their services. I have developed business relationships with industry leaders in the oil & gas, steel, transportation, biotech, technology, financial, and healthcare sectors. It’s been a pleasure being a part of growing RDG Filings to be the 5th most active filing agent in the industry. With the end of the limited liability exemption for XBRL, the future of reporting is in increased transparency and validations of your reports. There will be an ongoing need for guidance from XBRL experts. Companies have and will be striving to find a balance between time and cost efficiencies, all the while adhering to all SEC Requirements. 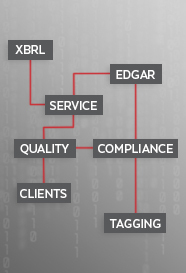 I know firsthand just how incredible RDG Filings is as an XBRL service provider. RDG provides clients with everything they need to be ready for the future of XBRL: a full-service platform managed by CPA’s who are fluent in the XBRL taxonomy. This platform enables you to create your own customizable timelines and offers fixed pricing. You will automatically receive a two tiered validation on all your reports, guaranteeing that you are following all US GAAP, AICPA, FASB and XBRL Reporting guidelines. On average, we have been saving our clients between 35-90% off of their SEC filing costs and trimming down their wait times between drafts by half. In addition to these metrics, you get to work with a group who was independently surveyed to offer the best customer service in the industry. A common misconception is that in-house control increases XBRL data quality. This is simply not true. While software gives the illusion of control, without the knowledge and tools to produce high quality XBRL data with proper understanding of the current taxonomy AND the proper methodology for XBRL data construction, it’s similar to expecting a novice driver to race in the Indy 500. Sure, you can do it, but you may not finish the race. Feel free to contact our Director of Sales, Stewart Walker, at : 415.643.6017.